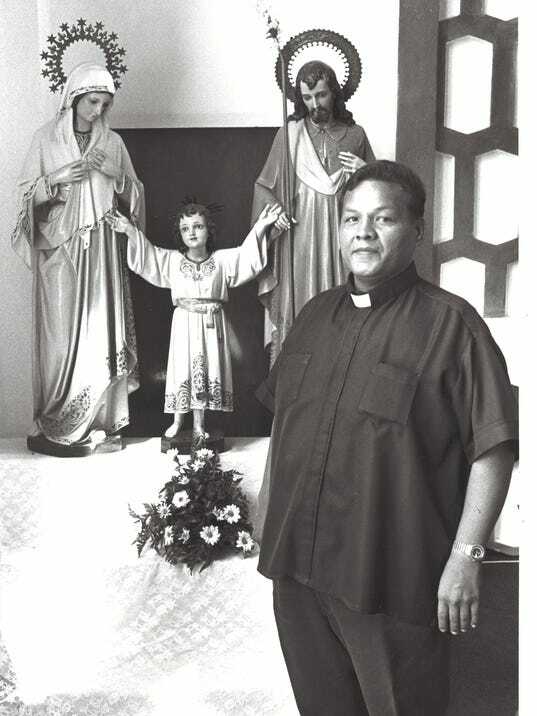 Asan village priest, Father Ray Techaira stands next to the Holy Family, Joseph, Mary and Jesus, in the Nino Perdido Church in Asan. on May 28, 1989. “A now deceased priest has been accused of sexually abusing a boy who had been ordered to stand in prayer with his eyes closed, according to a lawsuit filed against the Archdiocese of Agana Friday in federal court. The plaintiff, identified in court documents only as J.M.R. to protect his privacy, said in his lawsuit that Father Ray Techaira sexually abused him in about 1984 at the Asan parish office after the boy asked a question that upset the priest. J.M.R., now 49, was around 15 years old at the time and was attending confirmation classes at the Nino Perdido y Sagrada Familia Catholic Church in Asan, the lawsuit says. Techaira was a priest at the parish and was in charge of the confirmation classes. The priest told the boy he would talk to him at the office after confirmation class. “Techaira instructed J.M.R. to stand in the prayer position and started to unbutton J.M.R.’s pants and remove J.M.R.’s underwear,” the lawsuit says. The priest said the boy had sinned and that he was not ready to receive the sacrament of confirmation, and the priest again instructed the boy to close his eyes and pray, the lawsuit says. As the priest molested the boy, he told him, “I need to do this to you, to cleanse you of your sins,” the lawsuit states. J.M.R. threatened to report the priest if he didn’t stop, but Techaira said nobody would believe him, the lawsuit states. The boy did not return to the parish until after Techaira died, the lawsuit states. J.M.R., represented by attorney David Lujan, is demanding $5 million in minimum damages. The lawsuit named the Archdiocese of Agana as a defendant along with up to 50 other unnamed defendants.